Lauren Karnitz is actually a painter, but one Christmas she decided to make her sister, who is an avid recycler, a bunch of flowers made from recycled plastic. Her sister loved them so much, she asked for more, and so began Karnitiz's love affair with eco flowers made from recycled materials. Milk jugs, plastic bottles, sucker wrappers, buttons, electrical conduit, and recycled copper are all fair game for the Tennessee-based artist. She creates the flowers one petal at a time, and then puts them in arrangements in vases or uses them in corsages for special events like weddings. Check out the pictures to see if you can pick out what each of her flowers are made from. Karnitz draws much of her inspiration from nature and making flowers from recycled materials is in a way an ironic, because the plastic is imitating nature. After making hundreds of flowers, her skills have progressed, and she now sees each flower as a little ray of hope. What began as an experiment is now a passion, and she appreciates that her studio is a healthy non-toxic space as compared to using paints frequently. The studio is safer for her children, who are also little helpers and enjoy hunting for interesting materials to incorporate into her sculptures. Friends and family are also on the lookout for potential material, and Karnitz often finds herself asking if she can have peculiar pieces of plastic people are about to toss out. Her collection of eco flowers includes ‘planted’ arrangements in pots, arrangements in vases, corsages, boutonnieres, and flower patches. Some of her favorite materials include the humble milk jug, twist ties, water and designer drink bottles, sucker wrappers, expired credit cards, prescription drug packaging, straws, clothing tags, pencil shavings, and reclaimed copper tubing and wire from home remodel projects. She uses scissors to cut the plastics and wire cutters and pliers to mold the metal. Each petal is hand cut and glued into place with the aim of making the flower durable for those who are curious about its construction and want to hold them. Poppies, sunflowers, roses, grass, and other recognizable flowers are all part of the collection as well as some more abstract nature-inspired forms. Karnitz hopes to create larger installations soon, and is also available to make custom arrangements and corsages for special events like weddings. Eco brides – take note! 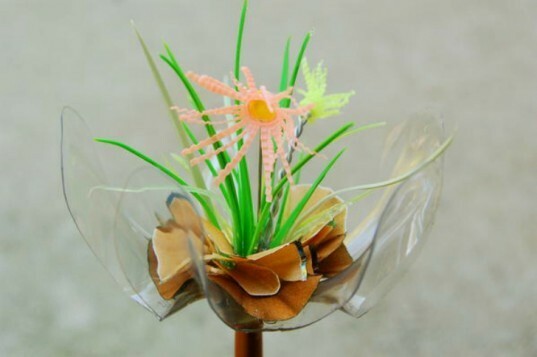 You could have all of your flowers made from recycled materials! Karnitz draws much of her inspiration from nature and making flowers from recycled materials is in a way an ironic, because the plastic is imitating nature. After making hundreds of flowers, her skills have progressed, and she sees each flower as a little ray of hope. What began as an experiment is now a passion, and she appreciates that her studio is a healthy non-toxic space as compared to using paints frequently. The studio is safer for her children, who are also little helpers and enjoy hunting for interesting materials to incorporate into her sculptures. Friends and family are also on the lookout for potential material, and Karnitz often finds herself asking if she can have peculiar pieces of plastic people are about to toss out. Her collection of eco flowers includes 'planted' arrangements in pots, arrangements in vases, corsages, boutonnieres, and flower patches. Some of her favorite materials include the humble milk jug, twist ties, water and designer drink bottles, sucker wrappers, expired credit cards, prescription drug packaging, straws, clothing tags, pencil shavings, and reclaimed copper tubing and wire from home remodel projects. She uses scissors to cut the plastics and wire cutters and pliers to mold the metal. Each petal is hand cut and glued into place with the aim of making the flower durable for those who are curious about its construction and want to hold them. Poppies, sunflowers, roses, grass, and other recognizable flowers are all part of the collection as well as some more abstract nature-inspired forms. Karnitz hopes to create larger installations soon, but is also available to make custom arrangements and corsages for special events like weddings. Eco brides - take note! 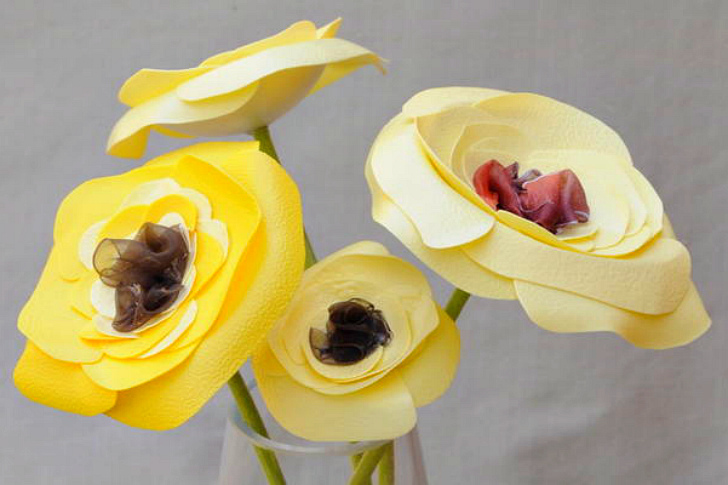 You could have all of your flowers made from recycled materials. Flower patches like this one are like terrariums.